Clint the chimpanzee is at it again. The first chimpanzee to have his genome sequenced in 2005 has now made another mammoth contribution to science, this time with his stem cells. Using these stem cells, Greg Wray, professor in Biology and Evolutionary Anthropology and his former Ph.D. student, Lisa Pfefferle, recently published an article detailing an exciting new genomic tool that provides a sneak peek into how fundamental differences at the genetic level can lead to drastic differences we see at the outward level between humans and chimpanzees. This fascinating new approach is based on a specific type of adult stem cells, known as adipose derived stromal cells (ASC). The beauty of ASCs is that they can be manipulated to morph into different types of mature cells. These cells can then be poked, prodded, and scrutinized under the microscope as a means to delve into fundamental questions regarding the molecular basis of human origins. This work adds a powerful new tool to the field of comparative primate genomics. The goal is to discover the source of traits that set humans apart from other animals, like spoken language or the sole ability to blush when embarrassed. By comparing humans with our closest genetic cousin, the chimpanzee, we can begin to uncover qualities unique to both humans and chimpanzees. These discoveries might lie within the genome. Using next-generation sequencing approaches, the researchers were then able to compare over 10,000 genes between human and chimpanzee. The results of this comparison show central differences within the set of genes that may be contributing to the obvious dissimilarities between humans and chimpanzees. For example, genes controlling the development and function of the immune system were significantly higher in chimpanzees than in humans. 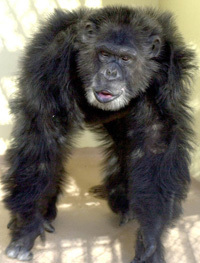 It is well documented that chimpanzees are able to heal wounds faster than humans. This may be why. In contrast, genes involved in the cell cycle and DNA processing, important for passing on genetic information and repairing DNA damage within cells, were expressed at a higher level in humans. This novel approach of using ASCs in a controlled laboratory setting will undoubtedly be a valuable complement to existing studies on comparative primate genomics.